​​Therapy Dogs do a valuable job by providing unconditional love, emotional support, understanding, and listening anywhere they’re needed. Many people are familiar with them visiting hospitals, schools, universities, group homes and libraries. But they also provide a valuable service at funerals, disaster sites or anywhere else emotions, grief, and tension may run high. ​The temperament of these dogs is sweet-natured, friendly dogs who are, first and foremost, pets. Their family trains them and has them certified or registered via a local or national organization if they meet the set standards and criteria. ​Therapy Dogs do a valuable job by providing unconditional love, emotional support, understanding, and listening anywhere they’re needed. Many people are familiar with them visiting hospitals, schools, universities, group homes and libraries. But they also provide a valuable service at funerals, disaster sites or anywhere else emotions, grief, and tension may run high. ​The temperament of these dogs is sweet-natured, friendly dogs who are, first and foremost, pets. Their family trains them and has them certified or registered via a local or national organization if they meet the set standards and criteria. Typically the venue has an agreement with an organization to provide these visits. The main function of these dogs is to provide comfort and companionship to those they interact with. 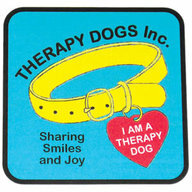 Therapy Dogs do NOT have public access, with or without their handler, and they may only enter buildings (that don’t allow all pets to enter) with a direct invitation to the dog and handler, or to the organization. ​If you'd like to get your dog certified or registered, here are some links to national organizations that provide the service. ​In addition to Ricochets SURFice dog® work, she's also a certified therapy dog through the American Kennel Club, Pawsitive Teams, and Therapy Dogs Incorporated. Cori is also a certified dog with Pawsitive Teams, and a registered with Therapy Dogs Incorporated. The goal-directed therapy work Ricochet does with Pawsitive Teams is significantly different from the usual “meet and greet” hospital and nursing home type of animal assisted activities. In the Paws’itive Teams PAAT program, the dogs are used as a tool and motivator to help clients (children and adults) achieve clearly defined goals as set by their therapist or teacher. 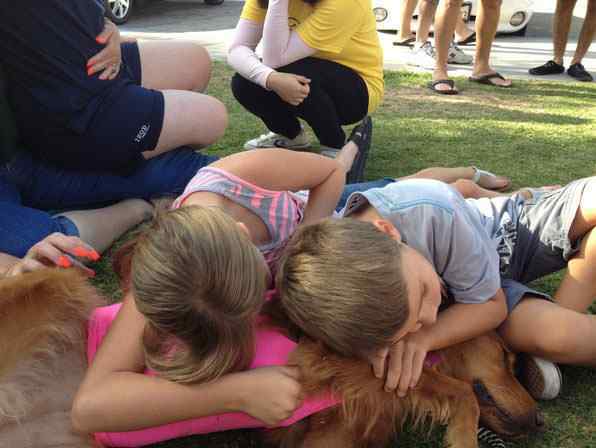 ​​The Paws'itive Teams program we're most involved with is the Canine Inspired Community Reintegration Program. 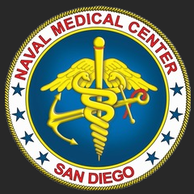 We work with outpatient active duty injured service members (Marines, Navy, Army) from the Naval Medical Center with the primary goal to give patients the support, encouragement and optimism unique to canine therapy. We work directly under the guidance of the Recreation Therapist for six weeks which is designed to help patients recovering from PTSD and Traumatic Brain Injury re-enter the community through establishing a greater sense of trust and less hyper-vigilance in public settings. Each service member participant is assigned a dog to handle during sessions which are held in a variety of community settings for two hours at a time over a six week period. The goal of the program is for service members to experience a reduction in their anxiety and other PTSD symptoms by having a dog accompany them. 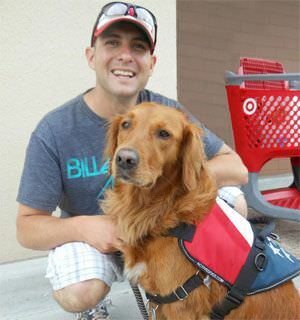 Although the dogs are working as highly trained, certified goal directed therapy dogs, this program gives service members insight into what it would be like to have a service dog. The dogs are given special permission to accompany the service member in places that evoke anxiety such as Home Depot and a number of other places. ABRAXAS HIGH SCHOOL Dog teams work one-on-one with students selected by the special education teachers. The Transition Students (ages 18-22) have developmental and/or physical disabilities. Some of the students are working on verbal skills, learning to speak more clearly while others work to develop greater range of motion for physical therapy. The special education teachers set the goals for each student and often the goals are written directly into the IEP for the student. During one of the therapy sessions, Ricochet began working with a young girl who has autism and uses an iPad to speak. Ricochet was able to learn how to take cues from the synthesized voice of the application so the girl could communicate with her independently. Check out the video below to see it in action! Under the direction of the District Attorney and Victim Advocate Offices, certified dog teams meet with children who have been abused and are having to testify in court. The dogs are a valuable tool to relieve tensions prior to testimonials and often aid in enabling these victims to give better testimonies, resulting in more convictions. Ricochet has also accompanied women in the military to their hearings for military sexual assault. The At-Risk Teen Program affords the opportunity to work one-on-one with troubled teens using certified dogs to help reduce problem behaviors. Partnerships are with qualified therapists, social workers, public defenders and probation officers who work directly with troubled teens and refer participants to Pawsitive Teams. It's a six-week program that is conducted in two venues; their Training Center and at an alternative high school in the San Diego Unified School District.